The Fork Gaiters add to the “Bobber” look. They help protect fork tubes from flying road debris. Yamaha's intend was to install these onto the lower fork tube area but I took two steps further and added sets to the upper fork tube area, in addition to fitting them onto the rear shocks. In furthering my "All Blacked Out" quest, I Powdered Coated the OEM Chrome Gas Tank Cap with "Wet Black" powder. First, I had to figure out how to do a "Lobotomy" on the cap itself. Once that was understood, it was just a matter of dis-assembly, powder coating, reassembly and putting the cap back on to the gas tank. It came out extremely well and now matches the "Raven" (Black) color of the Gas Tank as well as the "All Blacked Out" theme. 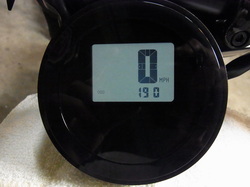 The OEM Multifunction Meter's LCD is extremely difficult to view depending on the position of light and in order to fix this, this modification was done. 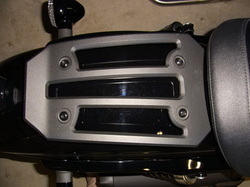 This is a Yamaha Accessories, rear fender rack for the Bolt. This is a modification to the Air Vacuum hose flanges, so that the Throttle Body Sync can be checked and adjusted without dis-assembling the Air Intake Filter Enclosure. Since the OEM Multifunction Meter's LCD is extremely difficult to view and the fact that the Bolt, should have come with an Analog Meter to start with, this is the next course of action that I took after doing the "OEM Meter LCD View Fix" Mod, shown above in a previous modification.